You could almost hear the air rushing out of a political agenda tailored around middle class malaise immediately after The New York Times published a story last April called “The American Middle Class Is No Longer the World’s Richest.” Here, with hard data, was that bastion of liberal thinking showing that the Canadian middle class was about to overtake the American on its way to becoming the richest in the world. Source: David Leonhardt and Kevin Quealy (2014). The New York Times. April 22nd. The story made the talking points of the federal opposition parties—that the Canadian middle class was under threat, not well served by current government policy, and in need of something better—look more like limp balloons on the floor of a party that’s gone on too long, than a front line of battle ready troops about to seize power. Trouble is, the claim that the Canadian middle class was doing better than the American lost sight of deeper trends. All bets are off now that oil prices have plunged, but the revised talking points of politicians are still no better at focusing on the underlying drivers of prosperity. The path to prosperity will be greased by a sliding dollar, Ontario’s time has come, and manufacturers will ride to the rescue! Unlikely, and if so, ephemeral, because the ups-and-downs of oil prices, or of exchange rates, mask more important forces. What was lost sight of during a decade long run-up in oil and commodity prices is the same thing we’re losing sight of now in expecting a sliding dollar to prop up the income of the typical Canadian. Global markets and a revolution in technology hold the promise of prosperity, a promise that needs sustained policy attention because it is fickle, uncertain, and unequal. The information in The New York Times story fell short of a complete explanation of middle income trends because it wasn’t detailed enough to highlight the huge variation across provinces. Statistics Canada data show that the last ten years have been a decade of lost prosperity in Canada’s most populous provinces. In Ontario the typical income has not grown since 1999, and things are not much different in Quebec. There has been no middle-income prosperity. 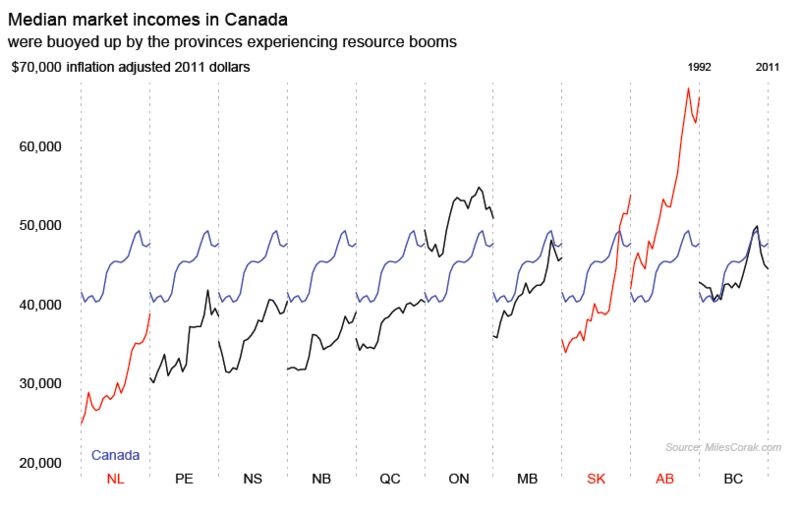 But incomes were on fire in Newfoundland and Labrador, hotter still in Saskatchewan, and even red-hot in Alberta. In 1992 the typical Albertan earned $42,000, about the same as the typical Canadian; two decades later, typical earnings surpassed $66,000 in Alberta, almost $20,000 higher than the middle ranking income countrywide. If the Canadian middle class was overtaking the American, it was because these three provinces had a greater presence in the overall scheme of things than North Dakota, where resource extraction also created a boom economy, had south of the border. It was because cycle masked trend. The much deeper US recession depressed American incomes to an extra-ordinary degree, while the oil and commodities boom buoyed them up in Canada. But now that oil prices have plunged, we are no better at keeping our eyes on the underlying fundamentals. Yes, Ontario manufacturers are hiring again; but some more than others. At ATS Automation in Cambridge the workdays of the middle managers are a little lighter, more time spent recruiting and training beats the years spent managing layoffs and restraint. They’re hiring workers who build and service automated platforms, laser processors, robotics, control systems, and high accuracy dispensing units capable of delivering drops of a drug, suspension, solution, or flammable and toxic chemical as small as 1/trillionth of a litre. The stars of the company’s promotional video on YouTube are not assembly line workers, who are almost entirely absent. They’re the few university grads working out the concepts in the back room, but mostly they’re the shimmering steel robots and the sleek control systems. The manufacturers who are hiring, and who are the basis for future prosperity and good solid middle class incomes, are those who build and install the automated units that are replacing the guys and gals on the assembly line. ATS epitomizes the underlying tide driving jobs and incomes when the computer revolution meets global markets. This tide never went away, even if just a year ago a swift current of oil made it easier for some of us to paddle in the opposite direction. It’s a tide offering prosperity to a lucky few, creating proportionately fewer jobs than Canadians need, and leaving many hanging on tight to whatever jetsam floats within reach. But this tide was always there, even when it looked like we were richer than others, and it will continue to leave many Canadians standing still, waiting, and hoping for the promise of prosperity even if a falling dollar offers some short-term respite. [ The theme of this post is part of a presentation I made at the School of Policy Studies, Queen’s University on February 5th, 2015.